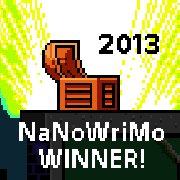 Another year's NaNoWriMo has come and gone. I succeeded in reaching the 50 000 word goal, although the story isn't complete. I count it as a win, but that's me being a bit of a NaNo rebel. Now that the push is over and every waking thought is no longer on getting out story to reach the 50k goal, it's time to figure out what happened. Sure, I had updates, but those were end of the week and reflected the ongoing concerns. (For those who missed and don't want to comb backwards, they are the two day, first week, second week, third week, and fourth week updates.) Time to break down the elements. This year, the writing wasn't a chore. The story flowed along for the most part. Part of the ease may have been the pre-NaNo scaffolding I did. I knew the characters for the most part, allowing me to let them move the plot along the best they knew. A friend even pointed out that I wasn't labouring to maintain the pace. Overall, the writing of the story felt natural. After eight years, I have found my voice. Also helping is maintaining this blog and the weekly Lost in Translation posts over at MuseHack. Writing 1700 words or more in a day no longer scares me. The plot of The Devil You Know worked out well. Again, it flowed without having to stop and do major research along the way. Sure, there were times when I needed to check some details, and the last week required a bit of research on illegal drugs and weapons, but small details happen. Back in October, I didn't expect a trip to Monte Carlo would occur in the story. At the same time, the locations used were a backdrop for the story and didn't need as much in-depth research at the time of writing. As I mentioned above, the story isn't finished. There are several scenes to go, including one to tie in the Gemma subplot, one for the drugs-for-weapons-for-cash deal, and one for the confrontation. I expect that there will be scenes in between each of those that will be needed as well. This is not a problem. I can also add chapters for Gemma's side of the story. The interregnum I added to figure out where she was could be removed if I go that route. I do have some events off-screen that should be brought out front. Gemma's side of the story is one. Karen's time with Ben can also be expanded. I wasn't expecting Karen to become as needed as she was. Again, the scaffolding I did prior to starting let me know what Karen could do, so her addition isn't so much a surprise as a natural result of what she would do as a character. The plot revolved around cryptocurrency, specifically BitCoins and their roller coaster value. BitCoins were meant as a virtual currency, and were key to sales on Silk Road. When Silk Road was busted up by the FBI, this gave me room to get Ione in on the plot, having her trace payments. BitCoin transactions are anonymous, but a little handwaving on my part and Ione can trace the coins she had in her virtual wallet. All the above background is just to set up the following: BitCoins were in the news in November. From the Norwegian who discovered his $26 investment was now a fortune to the currency breaking US$1000. If I didn't have details on BitCoins before November 1st, I did by the 30th. A lot of focus on the Segway of currencies. Despite all the pre-NaNo work, unexpected elements did pop up. The first was the mystical cat. Diesel was never meant to be magical. He was just a pet, something normal. I had even worked out his background; Diesel moved in the same day Ione and Karen did, just walking in to make himself at home. A parking ticket, though, led to him being magical. I didn't state it outright, but the epilogue will point out his nature. The next major element was Mara. In all my prep work, at no point did I mention her. Mara only existed because Jack's private jet needed a co-pilot. Sure, given Jack's nature, he could have handled the jet on his own. At the same time, it made sense for him to have an aide. Thus Mara. Mara's role expanded from being Jack's co-pilot and Ms Fanservice to giving Ione someone she could talk to since Karen was out of contact in critical scenes. The last element was the off-screen budding romance between Karen and Ben. Ben, it turned out, is quite the catch, seeing that Mara also had a crush on him. None of this was planned. With Karen, it came from a scene where she and Ben hit it off at a nightclub. With Mara, though, the crush highlights just how far off Jack is from the corporate line. The dreaded R-word. I will have to revise at some point, once the story is completed. However, I may send the novel out for an alpha read before starting to get feedback on the plot. Will I be rewriting from scratch? Probably not. My approach will be to make small fixes and make sure that, if the edits snowball, later chapters are fixed as well. The incremental edits stem from my issues with high school English, but I don't see the point of rewriting from the start unless something major was broken. In the case of a severely broken story, I would be better off scrapping the idea and reworking the plot and characters. Case in point, last year's NaNo project, Beaver Flight. As I said, this was my eighth NaNo. Eighth win, too. Each of the previous years, I tried to do something different, something to expand my skills. This year, though, I didn't really do anything new. I've written a spy thriller, Lethal Ladies, which you'll find posted on Fridays until I've reached the last chapter. I've written a few urban fantasies, including one that was meant as a paranormal romance but didn't become romantic. Even the crossing of the two wasn't new, really, more a melding of two similar ideas. The only thing that I can do new with this is finish the story, polish it, and submit it for publication.